We said a sad good-bye to all of our friends at Navdanya today as we raced away to Delhi to catch a flight to Leh. In fact, that is where we are now, Delhi waiting on our flight. We will miss our new friends a lot but we are sure they are having fun working hard on the farm and watching movies on the porch.?? (Hopefully you guys will get some rain so you don?? ?t have to work so hard and someone will show up with a good selection of movies instead of Disney junk (just kidding)). Our time at Navdanya was really valuable and we learned much more than we expected. I was also able to get a ton of photos and some of them might even be pretty good.?? Depending on internet connection and time I will try to upload a refined photo report to my site in the near future.?? Now it is time to take a little nap before boarding our flight in 5 hours at 5:30am.?? 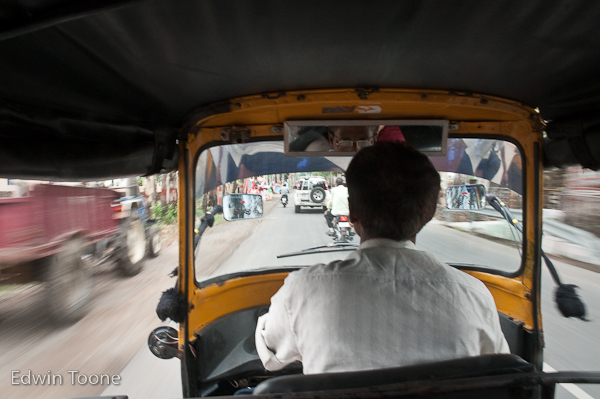 love this shot from the auto rickshaw!